Aptos Body Excellence Thread lifting is designed for lifting, contouring and rejuvenation of the body. Unlike other threads appearing on the market for the purpose of revitalizing the body, Aptos Body Excellence thread’s goal is primarily to lift the tissues. This is due to the unique, patented typical for Excellence Visage (awarded the Pearl of Aesthetic Dermatology 2013 in the category of "non-surgical facelift") projections, which provide excellent adhesion in tissues - although they are placed in a straight line, so that the tissues can move, guiding them to the correct position. Aptos Body Excellence threads are implanted in an extremely patient-friendly way, using bluntly-ended cannulas, not traumatizing the tissue, only by injection points without hatching. Threads are 25 cm long, which allows to adjust them to the needs of each area of ​​treatment. 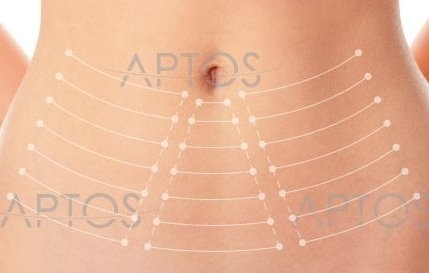 Using Aptos Excellence Body threads is particularly recommended for thick skins or areas occupied by cellulite. Using Aptos Body Excellence threads strengthens the tissue, making them more elastic and smooth, while improving their quality. In 1-1.5 years after thread implementation, they dissolve completely releasing the polylactic acid, which further revitalize the tissue and strengthens its structure. The lifting effect lasts approximately two years.